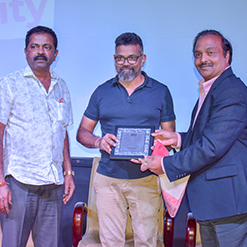 December 15th, 2018 :Digital Summit 2018 was a host for 1500+ attendees with 24-hour coding exploring trending technologies from AI to Chatbots through speaker sessions from top notch MNC's while creating a career gateway. 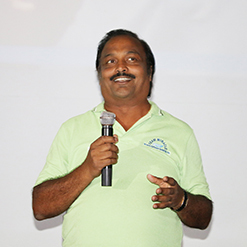 October 27th, 2018 : 2018's 3rd Quarterly Meet was studded with beautiful people, heartwarming smiles, resonating inspirational stories, full-on entertainment, honorable guests and lip-smacking food. 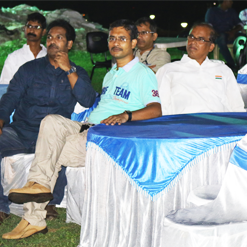 July 14th, 2018 : Our employees at the offshore facilities had a wonderful evening along with their dear ones at the 2nd Quarterly Meet. 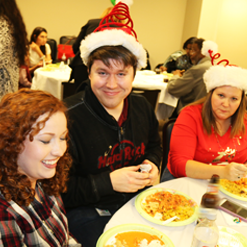 Everyone involved in the various events like skits, dances, singing, inspiring speeches and a delicious feast at the dinner. May 19th, 2018 : Our teams never fail to top whether it might be technology or sports! 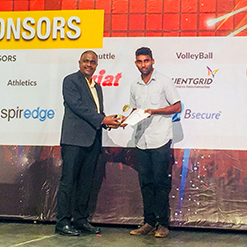 We have proved it again by creating a benchmark in this year's ITAAP Annual event as the winners of Cricket, Volleyball, and runners for the Shuttle. 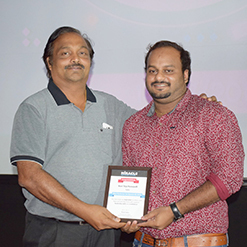 April 21st, 2018 :Our offshore facilities have enjoyed spending their time in 2018’s first quarter party with Adventure Race, entertaining events, best performer awards, Andhra style dinner, and many more. March 8th, 2018 :On the occasion of Women's Day, all the women dazzled the evening with traditional attire that filled the environment with a glaze of their beauty. 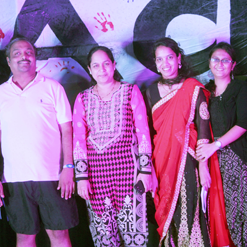 The event was engaged with lots of fun-filled activities. 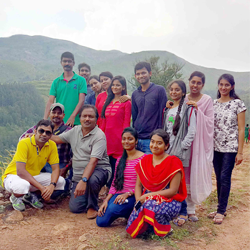 February 10th, 2018 : Gentle breeze, cool weather and wonderful nature all combine together called Araku valley which gave lots of memories to our Miraclites. January 20th, 2018 : "All work and no play makes Jack a dull boy" so we have continued to have the sports gala in 2018 as well with employee from all the offshore centers participating. 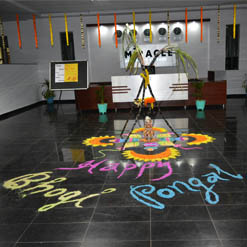 January 15th, 2018 : Beautiful kites, rangolis and bonfires made this year Pongal enjoyable at our offshore facilities. This three days festival brought more amusement and happiness to our Miraclites. 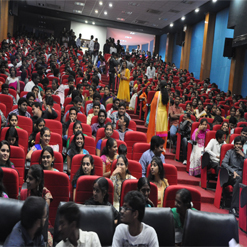 December 13th, 2017 : Digital Summit 2017 was a grand success and acted as a great platform for the students and IT professionals as it offered learning and career opportunities as well. 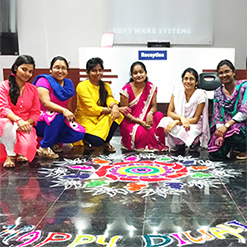 October 19th, 2017 : Traditional attires, lovely decorations, lightening flowerpots and delicious food has made this Diwali a truly enjoyable day for our Miraclites which brought the real festive feel at the office. October 14th, 2017: Miraclites celebrated their 3rd Quarterly meet with fun-filled games, soothing music, and delicious food along with lots of fun at Miracle Heights. The best performers were awarded and their smiles were priceless. September 30th, 2017 : Dussehra is one of the major Hindu festivals was celebrated with our Miraclites by recollecting Goddess Durga's victory, and actively participated in socializing and fun filled activities. 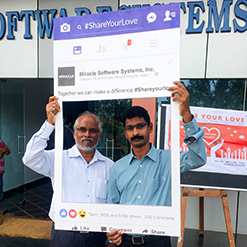 July 22nd, 2017: Most cherishing moment is Miraclite's spending best time with their colleagues and families. 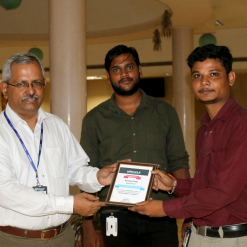 The Second Quarterly Meet of 2K17 went amazing with top class entertainment, special dinner and well deserved best performer awards. July 13th, 2017: A pleasant evening with a cool breeze, the ambiance was very much delightful. All the Miraclites were engaged in capturing the beautiful sceneries of Miracle surroundings to explore its beauty. 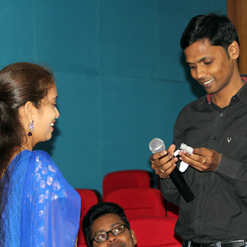 May 4th, 2017: The beautiful evening on the first quarterly meet of 2017 was celebrated successfully along with inspirational speeches, delicious dinner and special awards for the best performers. 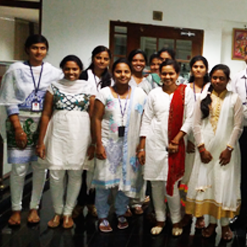 May 3th, 2017: We along with AP Cloud, have started a summer internship program at Miracle City for free of cost which is up and running with selected 60 deserving students. 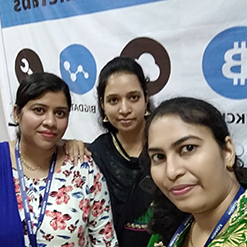 March 08th, 2017: All the women at Miracle had a fun filled evening with fun activities and a special dinner on the occasion of International Women's Day. 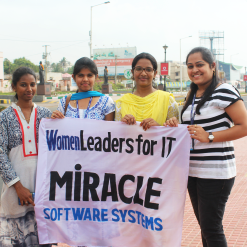 An IT walk was also held as a part of the celebrations. February 14th , 2017 : Roses are red! Love is pure! And it's Valentine's day. 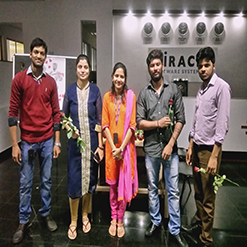 All the employees at Miracle City and Miracle Heights enjoyed the fragrance of love with the sweetness and pleasantness of the roses. September - January, 2016 : Thrill is not just winning, but a bravery in joining the race. 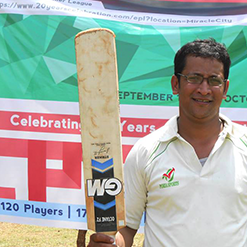 A 5 months marathon with 12 teams over 38 matches in the great cricket battle field finally made SAP Stallions win EPL Championship. 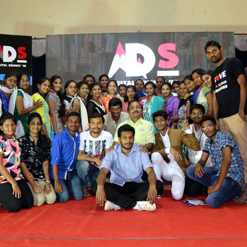 December 12th to 17th, 2016 : Setting a blend of knowledge and joy in each of the attendee's mind, Digital Summit'16 had refreshed everyone with inspiring sessions and fun marking Vizag as Digital Valley of the world. November 5th , 2016 : Fun, Food and Friends!! This was the only mantra followed by Miraclites at the winter picnic and bagged many everlasting memories with their family and friends. 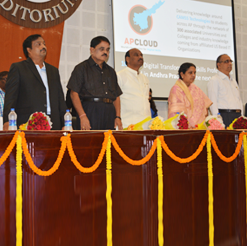 August 5th , 2016 : The vision to make the Sunrise State of Andhra Pradesh become the center of the world for Digital Transformation and Cloud Services has been launched by Miracle Software Systems. 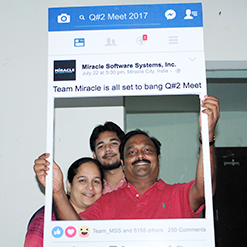 July 23rd , 2016 : Drizzling rain, pleasant climate paved the way for Miraclites to celebrate the 2nd Quarterly Meet in 2016 with family and friends by dining Pakka Andhra delicious food. 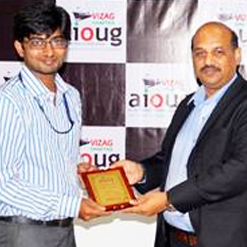 June 18th , 2016 : AIOUG Vizag Chapter, the very first technical event on Oracle in Vizag by Miracle Software Systems, Inc. has successfully created a learning space for technology explorers. May 27th , 2016 : Enjoyed cool delights in a hot blistering day. 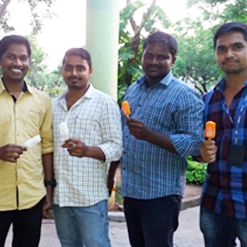 Miracle celebrated Ice Cream Day by having yummy popsicles of orange, mango and lemon flavours. April 27th , 2016 : Do you like to match up things? Then I'm sure you will like this! 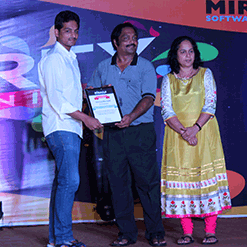 Miraclites enjoyed an event "Pick and Place" which was organized among our employees at Miracle City and Heights. 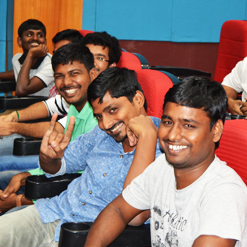 April 2nd , 2016 : On the occasion of first quarter wrap up, Miraclites celebrated the event very gloriously, looking forward to take up new challenges for the upcoming quarters. March 21st , 2016 : Crazy about yummy popcorn? Everyone does it. 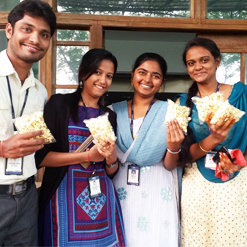 All the employees started their day with the tasty and fresh popcorn and felt fantastic by enjoying the crispness of the popcorn. 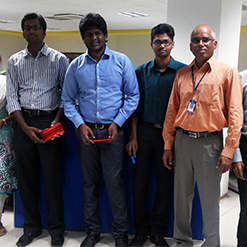 February 16th , 2016 : The cubicle contest showed the creative and innovative art of miraclites as they decorated their cubes with amazing hand arts, creative paper cuttings, colourful balloons and much more. 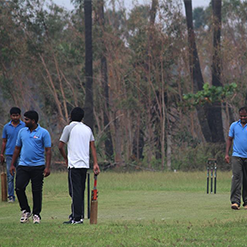 February 6th , 2016 : Lazy weekends will never be lazy if cricket is the best pastime. 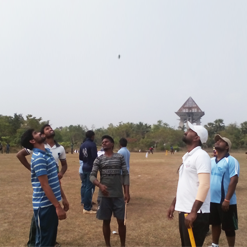 The super sixes tournament among nineteen teams gave the best entertainment for the employees during the weekend. January 26th , 2016 : Citizenship relies in service for country. Miraclites have proved it by organising social events at a Mandal Parishad School and at For The People Service Organisation by distributing to them stationary goods. January 15th , 2016 : With the burning bonfires and colourful kites flying all over the sky the four day festival had a very special part at Miracle. 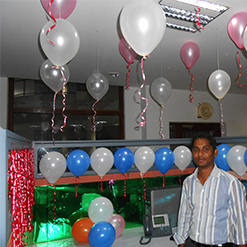 December 25th , 2015 : Jingle bells jingle bells jingle all the way through out the Miracle gave an auspicious day to all our employees who celebrated joyful Christmas with glory and happiness. December 19th , 2015 : Miracle celebrated the ultimate year end beach party with swirling waves, sizzling hot dishes and dazzling events with friends and families by freshening our achievements we accomplished in the year. 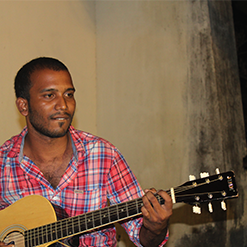 December 16th , 2015 : All the time music is the favourite zone for everyone. 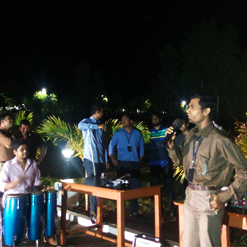 Our employees came together and celebrated moonlight musical night with joy and cheer which made the moon laugh and stars sparkle. 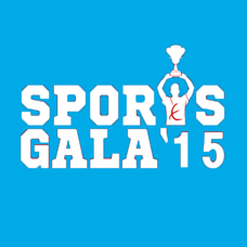 December 12th , 2015 : "Win if you can, lose if you must but never quit" became a main motto for all the Miraclites who have participated in the Annual sports Gala and made it successful. 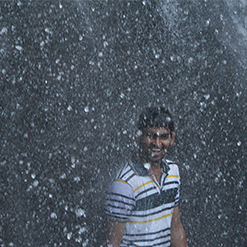 November 14th and 15th, 2015: Cool breeze, shivering cold and beautiful nature of the Araku Valley gave fun filled memorable moments to all our Miraclites. 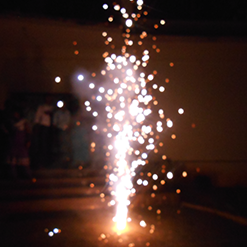 November 11th , 2015 : Miraclites celebrated Diwali with great gaiety and euphoria. 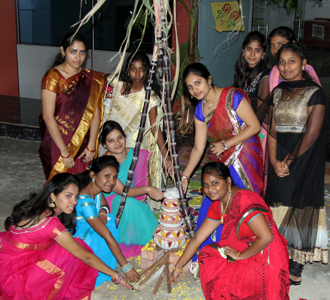 They had an auspicious festival with sky full of fireworks and heart full of enjoyment. 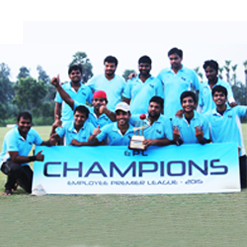 November 8th , 2015 : A long battle of 3 months by 8 teams with over 32 matches, the Mighty Bulls were titled as the Miracle Employee Premier League Champions. 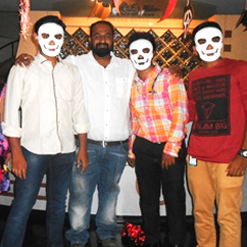 October 30th , 2015 : The celebrations of all hallows evening introduced Miraclites to the new festival where all the employees enjoyed ghostly surprises. 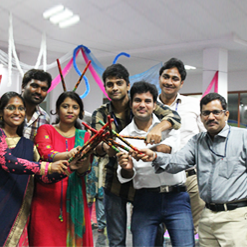 October 22nd , 2015 : Miraclites celebrated Dussehra as an auspicious day to inaugurate new beginnings and light up an year full of success. September 25th , 2015 : Is white your favourite color? If yes, then you have new beginnings and are seeking a unique direction in different paths of your life. 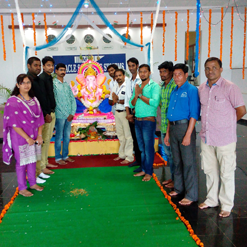 September 17th , 2015 : Miraclites celebrated Ganesh Chaturthi with great devotion and spirituality for new beginnings by worshipping the Idol in Miracle city and Miracle Heights. 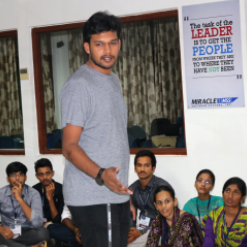 August 15th , 2015 : We the Miraclites celebrated our Second Quarterly meet on hill caps of Rushikonda with loads of excitement and new aspirations paving a grand way to success. July 31st , 2015 : Is there something missing? Found it? Why waiting then? Complete it! 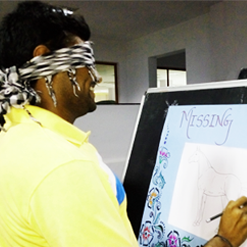 Miraclites enjoyed "Missing tail" an exciting event which was organized among our employees at Miracle City and Heights. 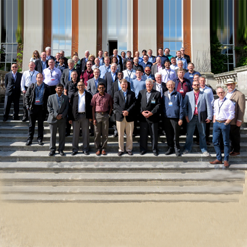 June 8th , 2015 : Miracle has attended Hursley North American Summit 2015 at IBM's biggest innovation labs to discuss and engage with IBM experts about the future of IBM products and Digital Enterprises. May 20th , 2015 : Which came first: chicken or the egg? Well! 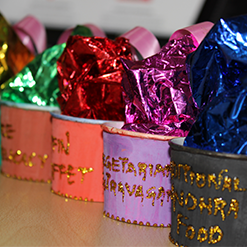 Miraclites celebrated Egg Galata on 20th May 2015 with a healthy motive by serving egg dishes to the employees. 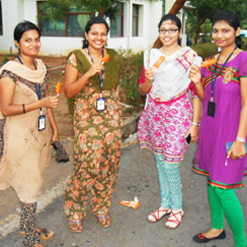 April 28th , 2015 : Every bit the hot blistering days are here and ahead, Miraclites celebrated Ice Cream day on 28th April, 2015 by having IceCream sticks of yummy flavours of orange, mango, grape. 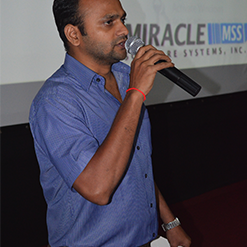 April 11th , 2015 : Miraclities celebrated the first Quarter of 2015 with excitement of the organization stepping into 21st year of its journey in the IT Sector. March 6th , 2015 : On the eve of Holi Festival all the employees of Miracle turned up their day very colorful with several different colored costumes and finally everyone got drenched up playing with colors. 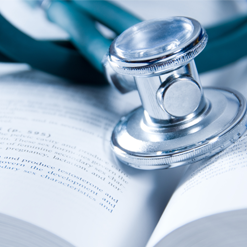 February 22nd , 2015 : A new way to think, a new way to work, and a new way to forward. 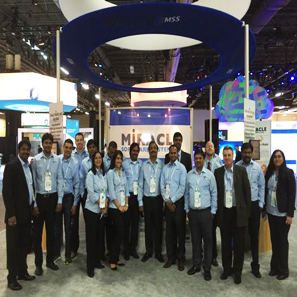 Being a Diamond Sponsor, Miracle enjoyed at Interconnect 2015 with over 20,000 people attending this massive event in Las Vegas, NV. 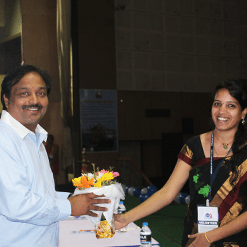 February 24th , 2015 : The effort of free medical camp organised by Tirumala hospitals provided a best impact and treatment to all our 110 employees approximately at Miracle city. 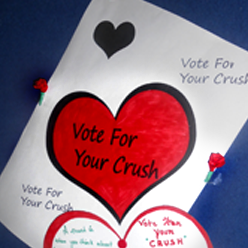 February 14th , 2015 : On the eve of Valentines day, All the employees of Miracle City and Miracle Heights came together voting for their crush and declared Mr.Valentine and Ms.Valentine and made their day lovable. January 26th , 2015 : On the day of India's greatest victory, Miraclites came together to achieve something much more significant . See how we brought smiles to over 300 kids. 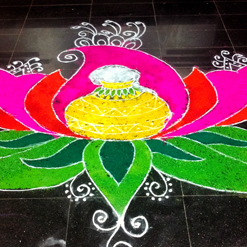 January 15th , 2015 : Miracle marked the celebrations of 3 day Pongal festival with Bhogi, Sankranti and Kanuma , distributing clothes to the labour along with a traditional dining on the last day of the festival. 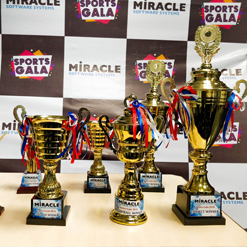 December 20th , 2014 : December was a time for celebrations at Miracle,They blew the roof on in a scintillating party at Miracle City, where over 700 miracles gathered to celebrate the grand achievement. 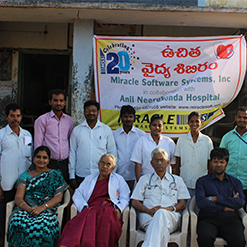 December 17th/18th, 2014 : Giving back to the society is an important goal for all Miraclites and that is exactly what was done with a 2-day medical camp in the villages around Bhogapuram. December 15-19th, 2014 : Flavours rose up to the occasion as dinner time at Miracle City became a prime attention spot. 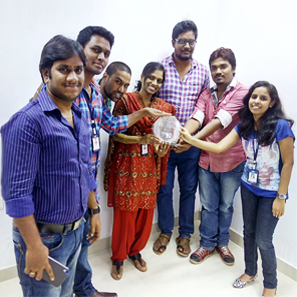 With an array of dishes being served for the employees including Traditional Andhra food. 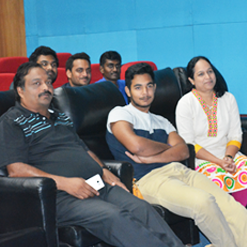 December 17th , 2014 : Continuing the effort to support our local community, Miracle employees got together to conduct a Blood Camp where almost 150 employees participated in the driven as part of the Month of Celebrations. December 15th , 2014 : Did you get Lucky? Well some miraclites did, as a surprise was sprung upon them with a cool game. 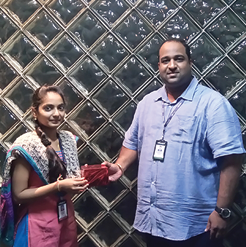 35 lucky employees were given gifts as part of the Month of Celebrations based on which chair they picked. December 14th , 2014 : One Miracle. One Dream. 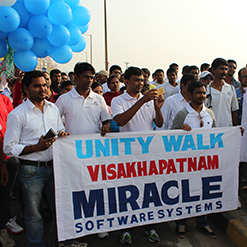 That is the message that each Miraclite was spreading out as They took part in a 4 Mile Unity Walk at Vizag's very own RK Beach. 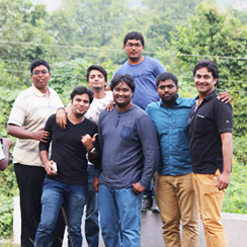 December 6th , 2014 : Cold and breath-taking are the two most apt words that describe Miracle's trip to the beautiful valley of Araku. 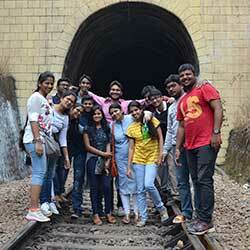 Campfires, waterfalls and long climbs were all part of the Miraclites fun. 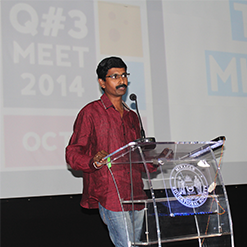 October 25th , 2014 : Team Miracle gathered together at Miracle City's Digital Auditorium to look back at the challenges and opportunities of 2014's 3rd Quarter. On the whole everyone at Miracle has a supreme night. 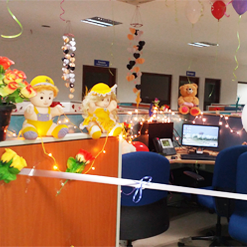 October 23rd , 2014 : Miracle City was in full pomp as employees had a fun-filled diwali with crackers, lights and beautiful decor. 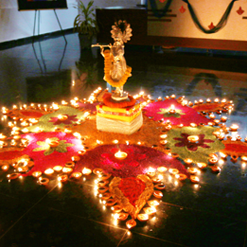 Rangoli decorations and arrangements of Deepa's adorned the entire campus. 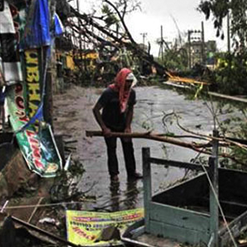 October 13th , 2014 : Disastrous in every sense, Hudhud took away more than we could ever imagine. 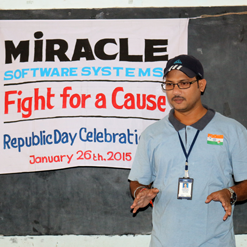 But this wasn't a challenge for Team Miracle was able to restore full operations within 36 hours of being hit. September 13th , 2014 : The Sportsman in all Miraclites was brought out as they participated in a 3 month long Employee Premier League. 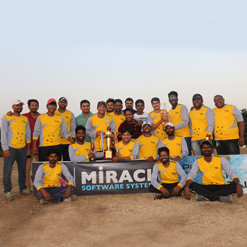 With 8 teams battling it out over 30 matches, the SAP Team was crowned final champions. August 2nd , 2014 : The Month of August not only brought fall with it, but it also brought the end of a great 2nd Quarter for Miracle. Team Miracle gathered together at Miracle City to celebrate its Q#2 for 2014 in great pomp and style. 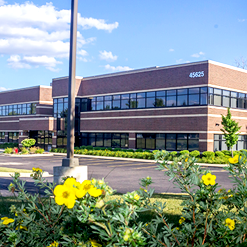 September 23rd , 2014 : The Workplace is a second home for many and it is here that you define yourself and your work. Miraclites were put to the test to see who had the most creative, beautiful and well adorned cubicle and the results were amazing.